The bladed terrain of Pluto’s Tartarus Dorsa region, imaged by NASA’s New Horizons spacecraft during its flyby of the dwarf planet in July 2015. Pluto's strange "snakeskin" terrain has an Earthly counterpart, a new study suggests. The "scales" of this alien landscape, which were first spotted by NASA's New Horizons spacecraft during its epic Pluto flyby in July 2015, are ice ridges 1,650 feet (500 meters) or so tall. But they're very similar to erosion-formed features known as "penitentes," which rise just a few meters above the ground in cold, mountainous regions of Earth, the scientists said in the study. 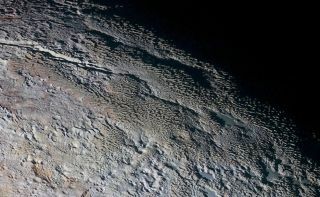 The penitentes of Pluto and Earth differ in both composition and size: Earth's are made of snow or water ice, whereas Pluto's ridges are mostly methane and nitrogen ices, the researchers said. Moores and his colleagues used computer simulations to model the growth of penitente-like features in Pluto's unique environment. Their results suggest that, although these ice ridges are currently known to exist only on Earth and Pluto, they may also be on other solar system bodies with the right conditions — for example, low temperatures and the presence of an atmosphere. New Horizons got within 7,800 miles (12,550 kilometers) of Pluto on July 14, 2015, giving humanity its first up-close looks at the faraway dwarf planet. The spacecraft is now cruising toward a Jan. 1, 2019, close encounter with a small object called 2014 MU69, which lies about 1 billion miles (1.6 billion km) beyond Pluto.